Swiss roll is one of many popular cakes in our family. I baked this green tea swiss roll last week and it’s gone within a half day. On weekend, I, again, baked this green tea swiss roll and brought it to a social gathering. Some of my friend asked where I bought it from. They thought it’s bought from a bakery shop. The swiss roll was gone very quickly. I have tried many recipes of making swiss roll, but many of them were very disappointing, either broken in the middle when I rolled it, too sweet or too hard. I was very glad that my dear friend, Josephine gave this recipe to me. I’ve tried her Swiss rolls many times and felt they were heavenly tasty. It’s a big success in the first attempt when I tried her recipe. Rolling the cake is also a challenge. Many people find that baking this swiss roll is not difficult, but rolling a beautiful Swiss roll is quite challenging. Very often, the smooth and nice surface of the cake would be peeled off after rolling. Here I’d also share some simple tips on how to roll a beautiful Swiss roll at the end of the recipe. Hope all of you enjoy. Preheat oven to 220C (428F). Line a baking paper/parchment paper on a greased baking pan. Stir in green tea powder into hot water and mix thoroughly. Mix plain flour and corn flour. Whisk the egg yolks with 100gm sugar until smooth, creamy but not bubbly. Stir in tea powder mixture and combine well. Whisk egg whites for a while until bubbles form. Mix in 60gm sugar with small amount at a time for 3 times, beat until stiff peaks form. Fold in egg whites to egg yolks mixture, 1/3 portion at a time. Sift in the plain flour and corn flour to the mixture. Then quickly add in oil. Pour the batter in the lined baking tray and level it. Bake for 10-15 minutes, or until golden brown. Remove from the oven and transfer to a wire rack. Let the cake cool down. Chill mixer and mixing bowl in the fridge for 15 minutes. Beat whipping cream with caster sugar with the chilled electric mixer and bowl until smooth and creamy. Turn the surface of cake onto a large paper. Peel off the baking paper. Spread fillings evenly and roll the cake. Cut edges to complete. For best results, keep roll in fridge before serving. After cooling the cake for a while, and the cake is still warm, use a clean tea towel to pre-roll the cake and let sit for 10 to 15 minutes. Then off you go for spreading the filling and rolling the cake nicely. The pre-roll method helps stretch the cake and then can be easily rolled in a round shape. The surface of the cake won’t stick onto the tea towel. When you're ready to roll the cake, use a sharp knife to score three lines at one end, each line 0.5cm apart. And start rolling from this end. Use a baking tray a bit bigger than mine, the cake would be thinner, and easier to roll. Your matcha Swiss roll looks fabulous! 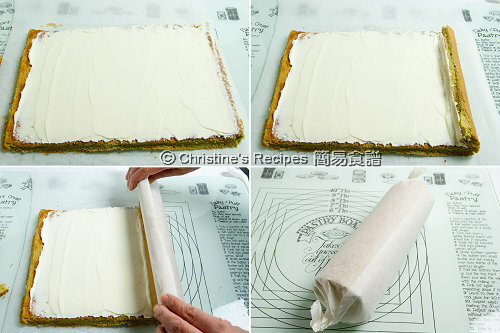 I could never underestimate how hard it is to make a swiss roll Christine! I've tried once in the past and failed miserably. I must try again using your tips. Do you have a recipe for a mocha roll? Hi Christine, that swiss roll looks wonderful! I love green tea treats. Is there a particular brand of green teat powder you suggest? Mmm.....looks perfect and delicious. My family loves swiss rolls...never stay long in my house. I have just learned recently. It's fun to make. I am a sucker for all the types of foam cakes! Yours looks magnificent! So pretty! I keep breaking my roulade. Will try again though. @Trissa, this is a basic swiss roll recipe. You can add espresso in hot milk, or even add chocolate powder into the batter. There you go and bake a mocha roll. @Cooking With Kait, I used Japanese 宇治抹茶. I've added a link in the "ingredients" section to show you the picture. wow. this looks absolutely perfect! Very interesting recipe. I've never seen anything like it before. What do you think of Asparagus Roll-Ups? Kind of a similar idea. Anyway, thanks so much for sharing this! I'll have to show my sister (the master cook) tonight! Ohhhh!! I didn't know what matcha meant until now! I've never made a "rolled cake" because I'm always afraid the cake won't roll correctly. Yours look great!! There was a time when I baked this swiss roll a lot; my kids would devour it and it was light. Then I stopped; I think I will start again after this post because I would like to try your recipe; how unusual to add olive oil and the matcha is such a nice touch. A gorgeous roll! It sounds amazing with matcha! I've been searching for a recipe for the swiss rolls they sell in the Asian bakeries FOREVER! This looks amazing thank you so much! That looks awesome! I'm always scouring the web for great green tea recipes. I switched over from coffee a few years ago for health reasons and have been running out of new ways to enjoy it. Never thought about using olive oil in a cake but will give it a try. I used to use matcha pretty sparingly since it's so expensive but thanks to the internet (again) I get it in bulk from greenteapowder.com and now use it more abundantly. I bet that inner filling would be great with some azuki red beans. Hi Christine, I've made swiss rolls before but what I can't seem to get right is the skin of the cake sticks to the paper and makes the cake look horrible. How do you stop your cake from sticking to the paper? thank you. Looks so good! I've always wanted to make swiss roll but they look and sound so difficult. Ohh, that's a fun little treat. I love the green swirl, it looks so pretty! Beautiful job! I thought pre-rolling with 2 sheets is already helpful, now you proved using a towel is not only smart but environmental friendly. Pre-rolling with a tea towel is the method of preventing the skin of the cake from sticking to the paper. What makes the skin of the cake stick to paper is the moist. If using the towel, the moist of the cake won't be trapped but escaped through the fiber. So I tried this method, it worked for me. You have to wait until the cake completely cools down when wrapped in a tea towel. Then you can roll it with the towel or a paper without ruining the skin of your cake. Your picture is very nice and the roll looks fabulous! My husband used to make these for our tea shop, and he would put anko(red bean paste) inside as well. BTW, we sell matcha specifically for cooking/baking in case anyone's interested, just let me know. That is so refreshing deliciousness. Thanks for the great recipe and tips on making this. Just curious; why do you score it before you start to roll it? OMG!! I have to try this! I love matcha. Your roll looks a-maz-ingggg. You can substitute it with vegetable oil. As this cake is very light, you might not want to use any oil with strong flavour that overpowers the taste of green tea. Hi Christine, can I use instant coffee powder instead of the green tea powder or expresso? If I can, how much will tablespoon would I need to add to the hot water? I made this today and my husband likes it but I had a few issues. My oven must be too hot because it starting burning on the top at only 200 degrees celsius after only 5 minutes. As a result part of the cake was undercooked but i covered it with parchment paper and cooked it longer at 150 degrees instead. The cake tasted very eggy and didn't take on the nice green color your photos have. I used the same matcha powder you had a photo of for your green tea chiffon cake recipe but maybe I'll use a more expensive one next time. I don't think I whipped the cream stiff enough because it started to leak out the sides of the cake when rolling. If I make it again I think I will probably double the green tea powder and maybe replace the oil with butter. I'll probably use icing sugar in place of caster for the filling to get it stiffer. Thanks for the recipe! I use your recipes all the time! It's hard to find corn flour here in UK, can u suggest any substitute for it? Tnx a lot! Was your cake placed too close to the heater in oven? Next time you can adjust the temperature if your cake turns brown too early and too quickly before it's cooked. The quality of green powder is very important too. I think you can bake better cakes next time. Try this method that I found on the internet for you if you want. But I haven't tried the method before, so don't know how the end result would be. I really love Swiss roll too and find myself making them all over and over again! They are so versatile too which makes them great for many occasions! 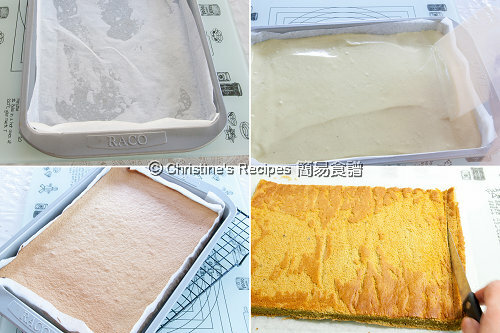 The method is to get the cake started roll easily by cutting three lines at the starting end. You can skip this step if you don't get it. It's ok. Thank you for sharing these hints, your swill roll looks so beautiful. HI Christine, I made your swiss roll twice and it turned out really good. My friends loved it and thought I bought it from the shops. I added red bean paste in the filling. Do you think black sesame powder will work with your recipe? Yes, I think you can use black sesame powder, although I haven't tried it. This recipe is making the basic swiss roll suitable for any fillings you like. I would love to try this dish but know I don't have the patience or the expertise reach the level that you did! Can you recommend anyplace online where I can order it for delivery? I got the pastry board at a local shop selling some crafts and small kitchenware. Is corn flour and corn starch the same thing? I looked up corn flour on the internet and it said corn flour is like corn meal. For this recipe can I use corn starch? Thanks! Yes, you can use corn starch for this recipe. I've made this recipe about 4 times now and i think i've worked it out better with a few minor changes. because I have a fan-assisted oven, it's worked out better at 150 degrees celsius for 15 minutes. i've used vegetable oil instead of the olive. i've also shelled out triple for the more expensive matcha in a little metal tin and it's been much greener with more green tea flavor. i needed more than 3 tbsp hot water to get it to not clump up. i put all the sugar to mix with the egg yolks instead of putting any into the egg whites. the skin always sticks when rolling, but i don't mind not having the skin so that's ok. i've substituted icing sugar for caster in making the cream. the cake is fluffy and yummy! thanks for sharing it! I just tried this recipe today! Very tasty, but two small issues - the cake came out a little bit denser than I'd expected, and the cream filling melted when I spread it on the cake. Any tips? Thank you for this great recipe! Try to fold in the egg whites quickly and pop in the oven immediately. Your swiss roll looks wonderful in the photos. I attempted to make this cake myself, but things didn't turn out quite right..
First I used a 33cm x 20cm x 2cm swiss roll baking tray (I thought that was similar enough to the tray you used). After I had whisked the egg whites into stiff peak, I had a huge volume of egg whites to incorporate into the egg yolk mixture. I hastily folded in the egg whites and flour because I thought I had to incorporate everything ASAP and get it into the oven. The batter wasn't as smooth as yours (from your photos). It was very volumised with small clumps of egg whites floating about. Anyway when the cake came out, it was very very thick (2cm+) and had lots of large air pockets inside - it was impossible to roll. Would the cake have come out thinner if (a) I had spent longer mixing the batter so it was smoother (instead of being worried about incorporating the egg whites and flour ASAP), and (b) the cake spent less time in the oven? Yes, you're right that the egg whites should be folded in as soon as possible and quickly. But I'm afraid that you haven't folded in the egg whites very well so resulting with "small clumps of egg whites floating about". And "lots of large air pockets inside" indicates the batter was not combined well or your egg whites hadn't been beaten well. If you want thinner rolls, use 2 trays of your size, or use half amount of all the ingredients in the recipe. I think you can use Golden Caster Sugar instead. your cake looks really good. Like the legit cake rolls I see in chinese bakeries and I'm itching to try the recipe out...but my one concern is the number of eggs yolks you're using. Are you sure we need to use 9 egg yolks to achieve the right taste? Is it possible to cut the number of eggs used down? Now worries. The taste was fantastic because I tried it a few times. But you can experiment with half of all the ingredients to test if it suits your taste. Use 4 to 5 egg yolks then. Today is my mom's birthday so I tried to make this beautiful (as pictured in this page) roll cake, but failed miserably..
My mom complains about egg yolks having too much cholesterol so I used only 6yolks [and 6whites]. I got a bit of yolk into the whites but ignored it...and got a peak-less, watery-on-the-bottom foam. So guys, get all that yolk out (i'm a newbie so I had no idea!). So My cake came out too dense.. Also, I used those Chinese porcelain spoons as a Tablespoon (I don't think they're the same). May I ask, are the plastic spoons/regular-sized spoons 1tsp though? When making the whipped cream, don't overwhip. I made butter the first time. Also, it wasn't very wise of me to make it on a day like this (86F high, 65% humidity) without a bowl of ice when beating the cream. My 2nd attempt.. was too watery and not solid enough for spreading. I read you can add gelatin to "stabilize" the whip cream. Are there any tips/suggestions you have for me? I will try again another day. And hope that it will be as pretty and fluffy as yours. Sorry for hearing that you failed in your first attempt, but glad that you knew what went wrong. So I think you'll improve in your next attempt. Your sharing here is very precious for other readers. Thank so much for your generous sharings. As for whipping cream, you don't need to add gelatin(I don't add any either), still can whip the cream successfully. Just chill your mixer and bowl before whipping, place the mixing bowl on a bed of ice (if the weather is too hot). One more thing, if your cream hasn't got enough fat, say if it's light cream, it's very difficult to beat and form stiff peaks. Use whipping cream for making desserts/cooking, or thickened cream. Wish your mother a happy birthday! 1) is plain flour = multipurpose flour? 2) in step5, sift in the plain flour and quickly add in oil. Do i mixed the plain flour together with the batter first then only quickly add oil OR sift plain flour + quickly add oil only i stir the batter? I've tried this recipe today, feedback i've received - cake is not soft enough (not fluffy, it's abit too solid). Any advice on how to make the cake softer? 1. Yes, plain flour is all purpose flour. 2. Sift the plain flour and corn flour beforehand. Then gently combine the flour into the batter. After combining the flour well, quickly add oil. This method would prevent the oil from sinking to the bottom. The soft and fluffy texture of this cake is produced by the air inside whisked egg whites. If the air in the egg whites deflate, the cake won't be fluffy. Did you beat your egg whites to stiff peak form? How did you fold in the egg whites? Hi Christine, thanks for the reply! once i combine the sifted flour into the batter, when im combining it, some of it become small lump, maybe i should combine small amount at a time rather than all together? Great, you're on the right track of beating and folding the egg whites. Yeah, it's better to sift the flour two to three times, then combine them with the batter in batches. Hope you'll be successful next time. I haven't got much luck with swiss roll rolling. Either I overbaked it slightly, causing the roll to crack or the skin gets stucked to the parchment paper. I'm going to try the tea towel method. Thanks for sharing! I tried the recipe today. The cake is very good, the only thing is is that I made the cake too thick. It was prone to cracking, but I found out if you used the towel method, it's much much better. I would decrease the sugar next time, I think a light dainty matcha roll slightly sweetened is a heavenly dessert! And I also added a tiny splash of vanilla extract to the whipping cream. I baked twice already : on Monday and yesterday (tuesday). The Monday attempt was ok but I have high expectation on swiss roll ever since I ate the one selling in RT Pastry. On Tue, I baked again because I think I have overbeat the egg whites the previous round, thus more difficult to fold in with egg yolk mixture. It was kinda lumpy. I made sure I didn't overbeat the whites last night. It turned out great. The cake is defnitely soft. But I was wondering how can I make it even more moist? Can I achieve it by adding more egg whites or perhaps yolks? thank you. 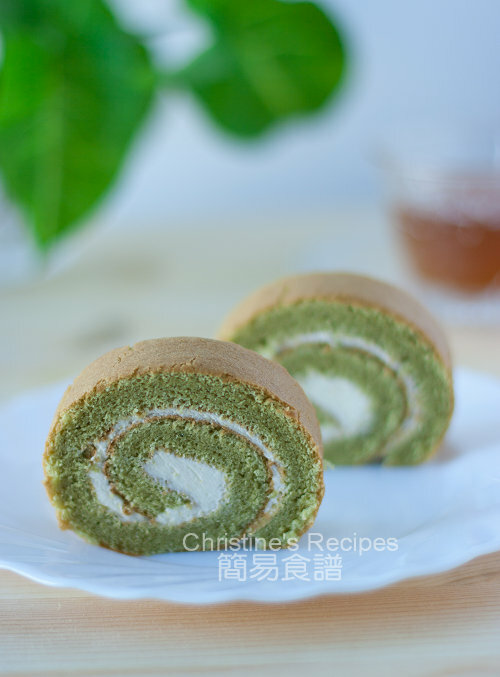 The swiss roll looks amazing...I'll definitely try this out since I'm a huge matcha fan. In the making of this cake..is it possible to use less eggs but still achieve the same result? After I fold in the sifted dry ingredients and add the oil, am I supposed to mix it again before pouring it into the pan? I assume we don't want to over-mix so I want to make sure before I do it. Once you fold in the flour and add oil, immediately pour the mixture into your baking tray and bake it right away, don't need to stir or fold anymore. Thanks Christine! It came out great, with only 1 small problem. When I dissolved the green tea powder into the hot water, it ended up as a thick paste that didn't incorporate into the egg white very well. The resulting cake ended up less green than the one in your picture and with small flecks of powder clumps in it. It still tastes great though - my family loved it! I will definitely try it again. Thanks very much for posting this recipe! Thanks for the extra tips, definitely useful. Do you know what went wrong? Could it be the cake was not cooled down? Hi. I'd like to try your recipe, but am wondering what corn flour is. Is it corn starch? Thanks! You can google the difference between corn flour and corn starch. Although they are not the same, you might use corn starch for making this swiss roll. 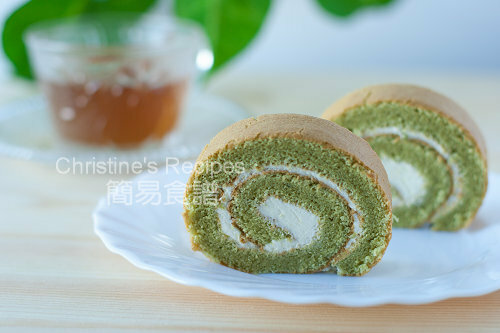 Hi Christine, love this green tea swiss roll. Would like to bake it for my family. But would like to ask what is the purpose of corn flour in this recipe? Is the corn flour same as those used for making tortilla? Hope you could share with me. Thank you. The corn flour used here, just like corn starch, is to help the cake workable in rolling. Hi do you have a green tea powder brand you'd recommend for this cake? My roll was just brown. Thanks! Thank you for sharing this wonderful recipe. How do you add in the oil at the end? Do you stir it well to make sure it mixes with the batter? When I made the recipe and poured the batter into the pan, there were large streaks of oil in it. What should I do next time to avoid this? Try to get Matcha and make desserts with it. It will give nice green colour. I often use 宇治綠茶 and am happy with it. Here's a picture of it. Hi christine. Can I make these into cupcakes? Haven't tried before. But I think you can. I tried this recipe today but failed miserably. I used a bigger pan (17 inch X 11 inch). The surface came out not smooth and I also failed to roll it nicely. Do you have any ideas on what's wrong? The common problems of making this cake roll are the egg whites not being beaten well enough and/or the folding-in not done properly. How was your batter? Did it look like mine in the picture shown above? Hmm, my batter was more watery. Does this mean that I didnt beat the egg whites well enough? How long do I need to do so then? I remember that the egg whites turned bubbly after I beat it..
How come when I whip the whipping cream it becomes watery after a while? I also tried whipping with icing sugar and it also became watery after a while. Suppose that you've got the right whipping cream, it should be chilled before whipping. Was the weather on your side too hot? If so, place the bowl of whipping cream on some ice. Keep beating the cream on medium-high speed, it would become stiff after a few minutes. So whipping cream should stay firm even if i don't add stabilizers like gelatin or agar? This problem always occurred for me. It looks firm, but once i put it in the fridge for a couple hours, water leaks out from the cream. Where do you live? I'm not sure what kind of whipping cream you can get? I often use Paul’s pure cream. Once it’s whipped, the cream can hold for a few day in fridge. The easy way to stabilize the whipped cream is to add some dissolved gelatin. Or you might like to get thickened cream, already incorporated gelatin in it. Use it to whip cream for making dessert. Very handy. I stumbled upon your website while looking for a good swiss roll recipe. I tried your's over the weekend and it gave me fantastic results! The cake was surprisingly moist and soft. Completely different from the ones i made in the past. Would you mind if i post this recipe on my blog (http://comingsoonlah.blogspot.com/)? I will link it back to this site. Sure, if you link back here, you're welcome. I have one question. Did you use yellow corn flower or white corn flower? Yellow corn flower is sweeter because it has sugar in it, while white corn flower doesn't. I feel like you may have used white corn flower because the color of the cake turned into a "laurel green" color. My corn flour is white in colour, not snowy white though. It's pure corn flour without any sugar added. Can I add cream of tartar to the egg whites to make it easier? Also can I add the flour to the egg batter, then add the egg whites to the batter, then the oil last? Will doing it this way affect the outcome of the cake? You could add cream of tartar to the egg whites for sure. It helps stabilize the beaten egg whites. The oil can be added in the very last step as well. I tried this way before. I mixed all the ingredients together apart from the sugar and egg whites. then I whisked the egg whites till stiff , but I find it easier to fold the batter mixture INTO the egg whites...and it still comes out beautifully .. Your swiss roll here look so pretty! I always fail in rolling cakes and end up having the cracked cake stacked up and cut into smaller pieces - then I call them shortcakes and say goodbye to roll cake! I am looking for green tea cake recipe now and glad that I found this post of yours!! We call plain flour in Australia, just like those called all purpose flour in US. Sorry, oven temperature listed here is way too high of a setting for such cake. I have successfully made other Swiss rolls before, so I was wondering in the first place but then thought I might give it a try of this new recipe, and I ended up wasted one whole Tbsp of expensive green tea powder. I would suggest for big conventional ovens, 190C (375F)would be a better choice. Sorry for hearing your bad experience. I tried this recipe a few times without any problem. As you know, every oven is so different, please feel free to adjust the temperature to suit your situation.